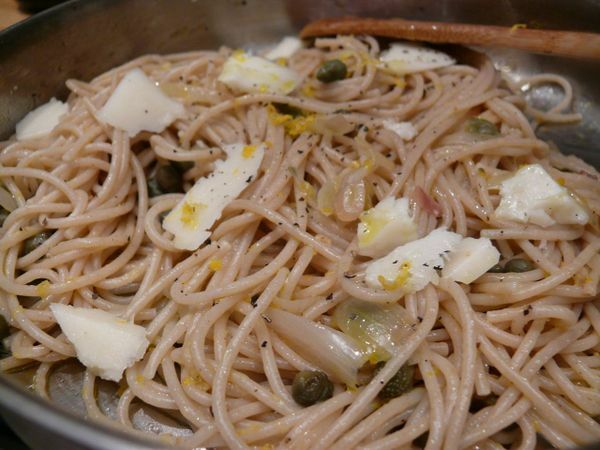 i've made lemon and caper pasta before but what a difference using meyer lemons makes! it took this dish from "like" to "irresistible" in my ranking and i ate way more of this pasta last night than i should have. meyer lemons provide pure lemon flavour without any punishing sourness. when i want this dish to be a little bolder, i use red onions, but the shallots make the sauce sweeter, so does the firm goat cheese i used (caprano), instead of parmesan. but you can see that you can play with the ingredients to get whatever end result you want. as always, it's just important that the ingredients be good–even more true when there are only three of them. it's a very simple, light pasta sauce and the perfect thing for a fast but satisfying dinner. but i can't wait to enjoy it over lunch with friends in the backyard! make sure your pot of pasta water is boiling, salted and drop in your pasta (i recommend any long noodle) just as you're ready to cook the sauce. heat oil in a large skillet over medium-high heat. add shallots and fry, stirring occasionally, for 3 minutes or until they become translucent. 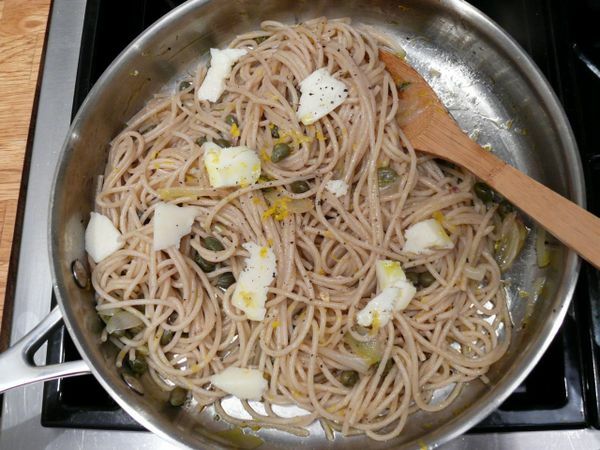 add capers, lemon zest (–reserving a pinch or two), lemon juice, pepper and a good pinch of salt (taste as the capers are quite salty). cook for a 1-2 minutes stirring until the lemon and oil come together. drain pasta and add to skillet. toss pasta well and shave generous curls of cheese onto the pasta. plate pasta, drizzle with a little olive oil and sprinkle with remaining zest. great hot or at room temperature.